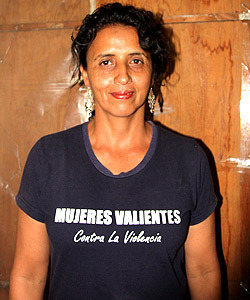 Dina Meza, a Honduran journalist and human rights activist, has been threatened repeatedly with sexual violence. 26 years ago I decided to study journalism at the National Autonomous University of Honduras. I began my studies in 1986, and dreamed of working for the big press outlets and speaking freely. But I never imagined that speaking, writing and telling the truth about what was happening could mean walking the line between life and death if anyone powerful in Honduras felt threatened. Serious threats to freedom of expression are on the rise in Honduras. One of the first killings of journalists took place on November 26, 2003, when the environmental journalist German Rivas, of CMV Noticias, Channel 7, was killed. Eight months previously he had been attacked, but the Attorney General’s Office never investigated, or brought the culprits to justice. Four years on, the crimes continued, and with the coup d’etat in 2009, intolerance grew to such an extent that censorship and self-censorship are now the inseparable companions of every journalist. Since the coup d’etat, 20 journalists have been killed in Honduras. The files on these deaths carry on gathering dust in the drawers of the Public Prosecutor’s Office, impunity tries to silence a story which was never told. Censorship and self-censorship are now the inseparable companions of every journalist. 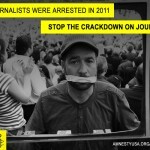 In this context, being a journalist in my country has become a serious risk. The risk is so great that students of the Schools of Journalism feel confused and ask themselves whether it’s wise to carry on or to change careers. And those who already work as journalists are frightened by the intense direct and indirect threats when they cover issues related to the structure of a country where the wealth is shared among a handful of families, who keep a whole country hostage. The dilemma is whether to silence ourselves or whether to allow this situation to silence us – to limit ourselves to speaking only about things which those people who want the truth to be hidden, would like us to speak about. It’s a very difficult decision because it affects every area of our lives: our families, our social contexts, our lives themselves. But if they manage to intimidate us and paralyze us, it will mean that we have become slaves to fear. Don’t think that I am not afraid; many times I’ve felt as though fear has soaked through to my bones, but the feeling of responsibility is stronger. This is a responsibility I must fulfill from the moment I decided whether to pass on to the next generation – which is risking everything – a subjugated country, or a liberated nation. A nation with freedom of expression and a people who are not intimidated by those who want to sow terror to achieve their aim of stealing our wealth and maintaining human misery on every corner. When I see the way information is manipulated and the way the truth is twisted in the corporate media, where those who are working towards a free Honduras are presented as “vandals” and human rights defenders are presented as people who generate smear campaigns against the Honduran State – that’s another reason I carry on working as a journalist. I have the obligation to make the truth known. I think that social transformation doesn’t happen overnight, and it carries a lot of risks, but if we don’t face those risks, we’ll be left without strength and without a nation to belong to. What can we do? I believe that if we begin by fighting for freedom of expression to be respected for one day, then after that it could be respected for two, three, four, and many more days…until we free the word, because we are more than our opponents, we are much stronger than impunity. Dina Meza is a reporter with Defenders Online and an activist with the Committee of the Families of the Detained and Disappeared. Amnesty is marking World Press Freedom Day on May 3 by taking action on behalf of Dina Meza and other journalists at risk around the world. This entry was posted in Americas, Censorship and Free Speech, Prisoners and People at Risk and tagged dina meza, Honduras, human rights defenders, individuals at risk, Journalists, press freedom by Guest Writer. Bookmark the permalink. I admire that you have chose to continue.